Hi friends...Welcome to AYESHA'S KITCHEN. 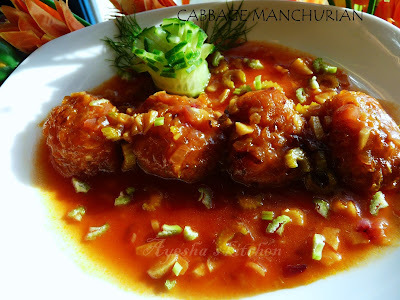 Manchurian is an Indo - Chinese dish and can be made with chicken, vegetables, paneer and so on. Here am sharing the recipe of cabbage manchurian which is an Indian invention of Indo Chinese staple that would be a great surprise to all Chinese food lovers. Here finely chopped cabbage is mixed with gram flour and other spices batter, makes small round fritters and then mixed with the thick sauce gravy. It has a crispy crust with much softness inside. 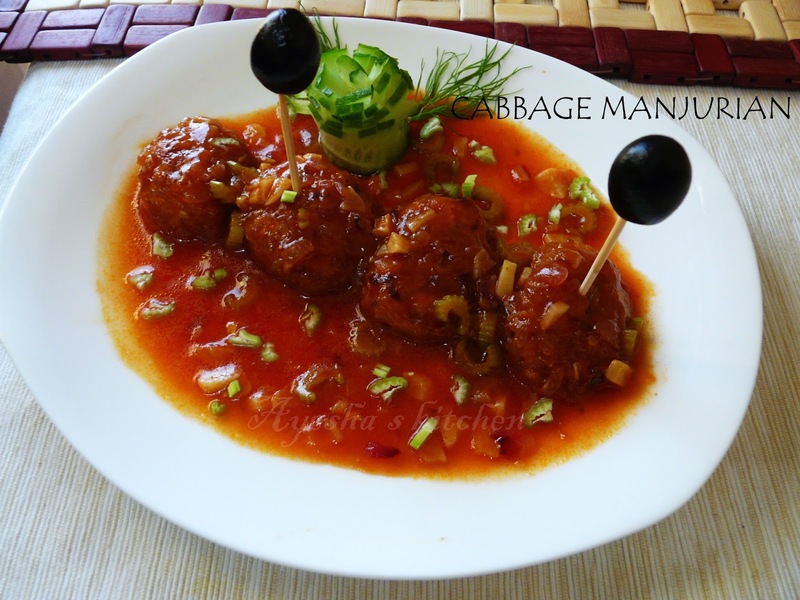 You can also add other vegetables along with cabbage and can make vegetable manchurian in the same way. This is a great dish for all veggies who love Indo Chinese cuisine. Mix together cornflour, gram flour, soy sauce, red chili sauce, garlic powder and salt in a bowl. To this add chopped cabbage, onion and mix well. The mixture must be little damp to touch and should be thick enough to make balls. If the mixture is too dry, add 1 tbsp of water. Heat a wok and deep fry these balls in a medium flame until golden. When done, set aside. Do not over fry. Now prepare the gravy. In another wok, heat 1 tbsp of oil and add onion, garlic, chili flakes, ginger and saute on a high flame for few minutes. Then reduce the flame and add soy sauce, chili sauce, pepper powder, celery and salt along with half cup of cornflour mixed water. Bring to boil. When done add the fried cabbage balls to it . Cook for few minutes in a medium flame. ( Adding of fried cabbage balls must be done only before serving. When ready to serve, heat the sauce and add the fritters). Garnish with celery and serve hot with fried rice, puri, chappathi..